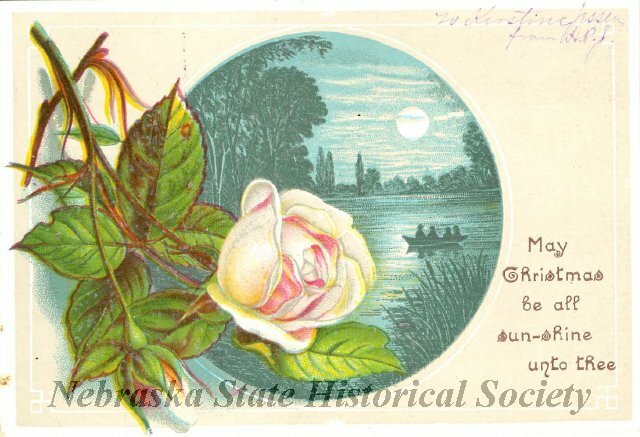 This Christmas card from 1880 depicted a warm-weather scene similar to one actually experienced by Omahans on December 24 in 1889. NSHS 3832-136 (at left). Freakish weather is not unique to the twenty-first century. The Christmas of 1889 in Omaha was memorable chiefly for the record high temperatures recorded there. The Omaha Daily Bee on December 25, under the headline “Mid-Summer Christmas Eve,” reflected the astonishment of local holiday observers who experienced anything but a white Christmas. The Bee said: “It may be doubted if Christmas eve in Omaha was ever characterized by the summer weather which prevailed yesterday. The thermometer at noon noted 73 degrees.” Official records listed a high of sixty-eight degrees, still the warmest December 24 in Omaha’s history. Accordingly, heavy coats were cast aside, doors and windows were opened, and men walked the streets in shirtsleeves. 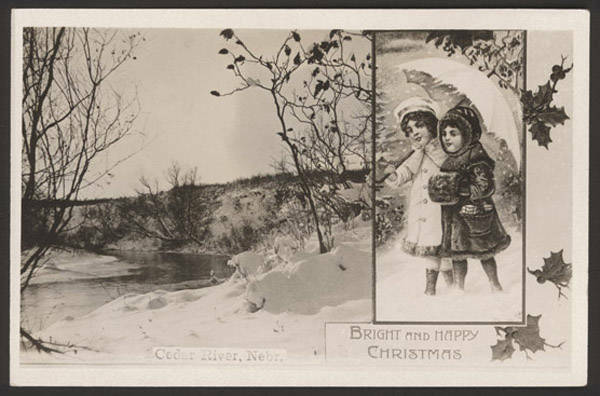 Some Omahans on December 24, 1889, may have wished for the idealized winter holiday depicted on this Christmas postcard of the Cedar River in Nebraska. A drawing of cherubic girls is inset into the photograph. NSHS RG3542-142-3 (at right). To the poor and homeless of Omaha the warm weather, said the Bee, “has been a benediction. They have been spared the suffering and misery of cold in wretched hovels and tenements, while thousands have had their season[al] outdoor labor extended and their income swelled by what otherwise would have been unearned dollars.” The only Omahans unhappy about the mild holiday weather were the coal dealers, “shivering for want of sustenance,” and the ice sellers, who were “praying for a blizzard.” They were soon to get their wish. On December 28 a thunderstorm with lightning, torrential rain, and then hail struck the city. Temperatures were expected to reach fourteen degrees above zero by the morning of December 29. Winter had returned.